From time to time I run into fellow Zook owners at various locations. One of us usually spots the other checking out the other's rig. The routine is fairly standard: We greet, identify our rig to the other party, and ask questions about the other. Recently in my travels I met with an older gentleman driving a Hopestar ON 360. Looking very much like Indiana Jones with a hat and whip, what started out as a polite greeting evolved into an hour long discussion at the coffee shop we had parked near. The driver introduced himself as Casey Fenderson, trailrunner extraordinaire. As we talked he pulled from his weathered military backpack a leather-bound photo album. He looked at me mysteriously and asked, "Would you like to see what I've seen?" I eyed the embossed "S" on the binding and knew I was about to embark on an adventure of Kodak moments. "So... you kids with your Samurais, you say you've been in some adventures?" "Oh, heck yeah! There was this one time when I was out with the guys from Beanco... We were driving up a hill..."
"Up a hill," he said in his faded voice. "You mean to tell me you're wasting my time to tell me about HILLS? When I was your age we backed up the sides of MOUNTAINS with our Suzukis. Don't you guys even BREAK things on your trucks before you get stuck?" I could tell this might turn out to be one of THOSE conversations, so I Ordered another tall double mocha latte and replied, "Well yeah, of course we break things. There was this one time last summer when I got a flat tire, and we had to get out in the mud and fix it." Casey stared at me with his dark beady eyes and poured something into his coffee from a tarnished flask he kept in his vest pocket. "What kind of rookies am I dealing with here?" "Uh, a Seasoned Rookie, sir." I didn't know how else to respond. "You don't know adventures yet," he said as he pulled his glasses from one of his many vest pockets and set them at the end of his nose. I couldn't help but wonder what he meant as he untied the leather fastener on his photo book and slowly opened the cover. "This one here, the driver was actually TOO good..."
"Too good? How could one be too good," I interrupted. Casey shot an annoyed look at me. "The driver was used to the extreme situations and had developed such an acute set of reflexes that he was able to sense an impending rollover and was able to react and position his body before the truck actually rolled. Needless to say when the gravity shifted and the truck ended up not rolling, the driver followed the intended path. Very pessimistic if you ask me." "Could this be indirectly related to bump-steer," I asked? "It might," he replied. "A lot of times a driver will have too tight a grip on the wheel and then hit a rock. In most cases though, the driver will just be flung from the window when that happens." "I noticed that when I thumb through the book here, the pictures are mainly Suzuki related. 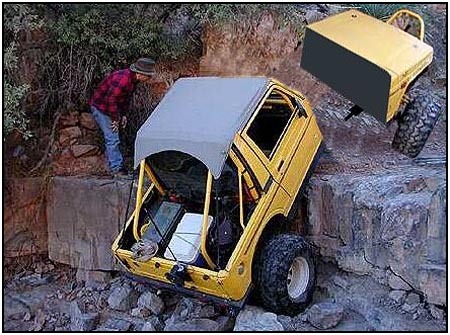 Have you ever come across other makes and models as you hit the trail? "Yes," he replied. 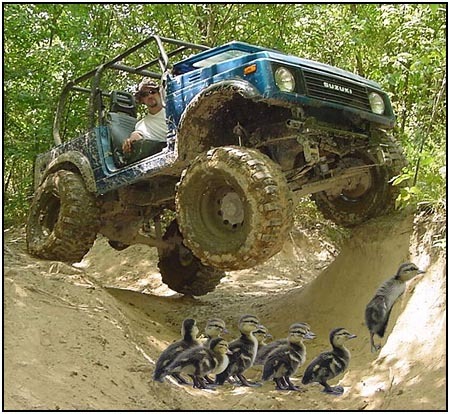 "Just recently our group crossed paths with a group of vehicles known as Ducks. They have been around for years and are quite capable. I'd say they're the ultimate amphibious vehicle. They appear to run on a raw ethanol blend of fuel. Now as you can see in this photo, Zookers are quite courteous by nature and we're allowing this group of ducks to pass through. I turned some pages ahead as we discussed modifications he had done to his truck over the years, adding larger engines and lower gears. I couldn't help but wonder aloud, "How much is too much when it comes to power? Certainly there has to be a line where the truck just can't handle any more in stock form." He lit his pipe, an old Kay Woodie, and took a deep puff. "Actually, that's a fairly common problem. And amazingly enough, it's the basic parts that always cause the problems. Take for instance this photo here. The driver did the usual "quick and dirty" big engine upgrade with lower gears, but never bothered to consider the driveshafts. The older style shafts use slip points which allow the truck to stretch a bit while going over larger hills. You've probably seen some trucks called LWB's where the stretchy shafts wore out and the truck was stuck in the extended position. Well, what happened here was the other extreme. The shafts had lost their elasticity, but in the compressed position. Mister hot-shot here went to climb this hill and the shaft started to stretch, then suddenly the shaft slipped from its yoke and took off on its own. "This seems like a serious problem," I replied. "I'm surprised I haven't heard of this happening to anyone I know. What can we do to prevent this sort of problem from plaguing our trucks?" "Well, there a few ways to go about this. The easiest would be to take the truck to your local welding shop after you've had it lifted and have the u-joints and slip joints welded solid to eliminate all that dangerous flex. A lot of places will do this as a package deal with muffler bearing replacement and carb belt adjustment. We turned a few pages ahead to what appeared to be a young lady in some serious trouble in some sand dunes. "Woah, what happened here," I asked. "That looks pretty serious - did she slam into a really thin tree while driving at a medium pace?" Casey shot me one of his many looks of annoyance, indicating my naivety was getting on his nerves. "Why does everything have to be these cartoon scenarios with you, boy? 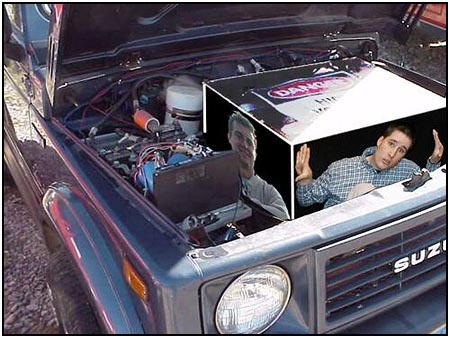 This is the problem with you kids and your fancy SUVs with air conditioning and electric radios... you forget the basics. What happened here was the driver forgot to lock her hubs before she started on the trail. As you well know, the lug nut bolts extend through the whole body and pull the truck together on a lateral plane. In this case the hubs were not locked, and the vehicle halves pulled apart at a very inconvenient time. A lot of drivers will only lock their front hubs, which is a bad habit to get into. "Was it too late to save her rig," I asked with a rather concerned tone of voice." I see she's frantically trying to lock her rear hubs and pull the truck back together. Did she succeed? "But of course. It's a Suzuki." Casey turned the page and my eyes lit up -- I finally saw something that I recognized: The RTI ramp. Finally I wouldn't feel so unknowing as we talked. "I see here we're measuring the Ramp Travel Index, this guy looks like he has some serious flex going on!" Again, the cold stare. "What are they putting in that coffee you're swilling? This here is nothing of the sort. RTI stands for something in Latin, which I can't remember right now, but has nothing to do with flexing and such. 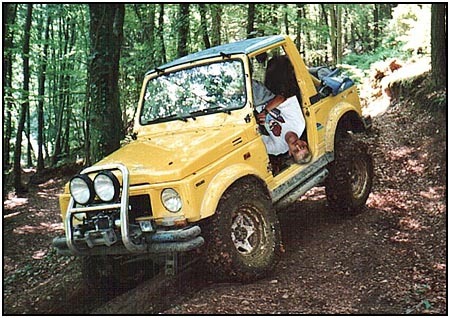 As you know the Suzuki is a very simplified vehicle and every part relies on the other in a harmonic balance to work together - that the truck would flex enough, but not so much to lift a tire from the ground. You see, it's the weight of the body that holds the vehicle together until the rust-welding compound sets in. From what I remember here, the driver had hurried up the ramp at an alarming rate and threw the whole truck out of balance. The man here in the photo drove too far up the ramp and since the weight of the truck wasn't there over the wheel, the non-force on the axle cause the wheel to slide right out. "Woah! What happened to this guy?" "Something completely different," said Casey. "Now Casey, it seems to me that you've got a lot of memoirs here about problems with people's Zooks... what about experimental stuff? Any new hybrid power sources?" Casey then decided it was time to go, and he wrapped up his leather bound photo album and bid me farewell. As he backed out of his parking spot, I ran back to his truck for one last round of questions. "Hey Casey? Those pictures you showed me... and the stories... Was that... I mean, was it all true?" Casey smiled and shook his head as he drove off through the parking lot. *Note* "The photos appearing in this months edition can all be found in various articles located here on Izook. They were meant purely for fun and not with intent to insult or demean the subjects or their driving abilities." "We here at Izook would also like to emphasize that this article was written tounge-in-cheek and none of the information in the article should be taken seriously." Remember. There is no shame to being a rookie -- you're trying something new. A Seasoned Rookie is someone who comes back again and again.